TemperLok™, Heat Isn’t All You’re Saving. PDC Spas has engineered a unique system that maximizes energy efficiency and minimizes heat loss rivaling our foam-filled competitors. 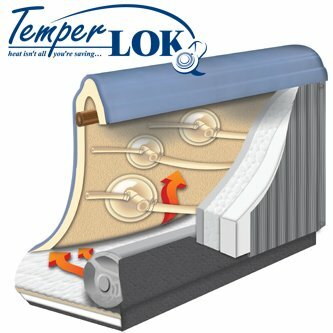 Unlike foam-filled units which hide manufacturing defects and make servicing expensive, the sophisticated engineering of our TemperLok™ system keeps the spa lightweight, economical to own and operate. 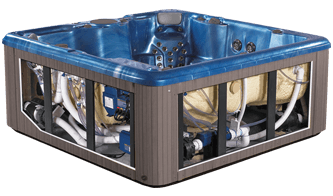 The PDC Spas design assures your insulation is intact from the day you purchase through the decades of enjoyment. TemperLok™ ingenuity was developed considering low monthly costs, service and installation for your long-term satisfaction. Waste heat from pump operation warms the air cavity behind the cabinet and is radiated and absorbed back into the spa plumbing. Warmed air is trapped between our TemperBase™ insulated floor panel and cabinet top gasket creating efficient thermos air tight insulation. 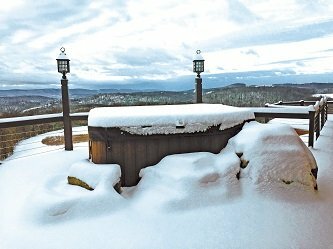 From the bottom up, PDC Spas assures your unit is protected from cold temperatures and unwanted outside elements. A three-layered floor construction includes a tough ABS plastic which seamlessly covers the entire bottom, wrapping upward onto the cabinet sidewalls. A thick layer of foam insulates for temperature control while the wooden layer provides strength and rigidity for a unit that is both energy-saving and durable. An inside reflective thermal barrier ensures outstanding thermal efficiency. PDC Spas TemperLOK™ insulation system provides maximum energy savings while maintaining a lightweight unit for easier installations. The use of a strong fiberglass, non-filled resin backing with an insulating foam coating provides maximum strength and efficiency. Using this process, a PDC Spa is more costly to manufacture, however each and every PDC spa unit is made with quality and efficiency in mind.